Tash Yoga ~ Empowered Prana Flow Yoga: "Yoga Fears Raised"
Someone bought my attention to a Letter to the Editor, published last Thursday in a local free press newspaper. I love that we live in a country where we have the freedom to express our thoughts and opinions, and I totally respect the author for airing their concerns, doubts and fears. It's so great that we can freely have public debate and are able to choose the beliefs and values by which we live our lives by. I'm grateful for people like Vic Trudeau, who give us 'food for thought' and an opportunity to question our own values, beliefs and habits of daily life. Im grateful that this published letter has sparked emotions, passions and debate amoungst my peers. Passion fuels love and action. I love that these strong words allow us to ask oursleves deeper questions and demand that we question the things and people around us and draws us deeper into oursleves. Yoga is based on this inquiry into Self. 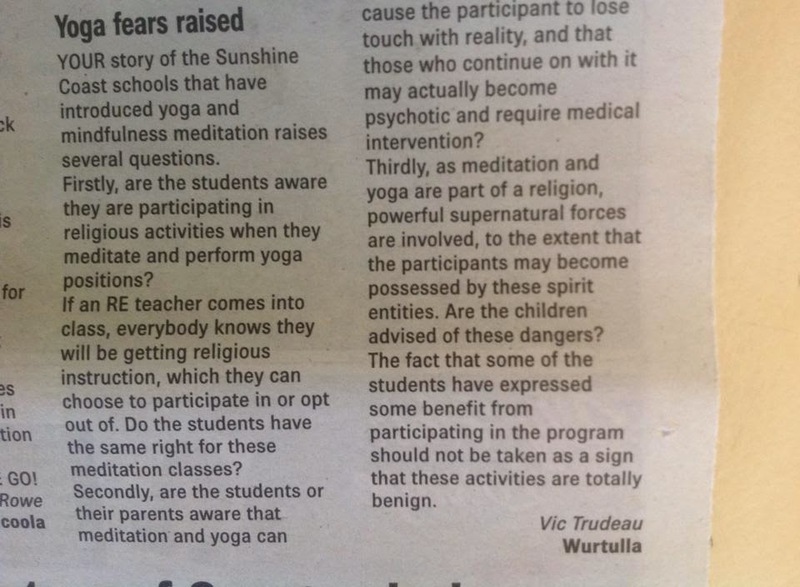 With reference to Vic Trudeau’s letter published in The Kawana Weekly, Thursday Sept 11th ,as a qualified childrens yoga teacher, currently teaching yoga in schools, I wish to comment on the ‘issues’ presented in their letter. Firstly, Yoga is a Science. It is a science of well-being, a science of youthfulness, a science of integrating the mind and body through movement and breath. It is a science of how to take a human being to their ultimate potential. Meditation is a naturally occurring resting state. Meditation teachers or coaches may give people some tools or techniques to help them access that natural state, where you are wide awake inside, and yet the body is relaxed into a state more restful than sleep. A modern definition of Religion is: a personal set or institutionalized system of religious attitudes, beliefs, and practices; a scrupulous conformity; conscientiousness; a cause, principle, or system of beliefs held to with ardor and faith. We all know what religion IS, we’ve all had experience of religion. We know all religions bind disparate people together, to a church and a common basic belief system which is mutually upheld and constitutes the religion. Hopefully they all have an up-to-date map to God. Yoga, on the other hand, does not bind separate or individual groups together. Unlike religion, in its pure form, Yoga has no organized institutions. Yoga is concerned with direct experience and observations. What religion you belong to has nothing to do with your ability to make use of the yogic systems, because yoga is a science. Science does not make any distinction as to what beliefs you hold. What you may believe in or not is purely a psychological process – it has got nothing to do with making use of a science. The sciences of yoga and meditation do not impose any beliefs on anyone. You can worship a rock, a cow, your mother – you can worship whatever you feel like. Yoga is not a religion or a church. It requires no belief in a doctrine, no credo. It does not require anyone to adhere to a belief system. Yoga is Hindu just the way gravity is Christian. Just because the law of gravity was discovered by Isaac Newton, who lived in a Christian culture, does it make gravity Christian? Yoga is a science. Anybody who is willing to make use of it can make use of it. It is ridiculous to even think that there could be a religious tone to yoga. Finally , I invite Vic to attend any of my childrens ( or Adult) yoga sessions, speak to teachers or parents of students I’ve taught and to contact me via info@tashyoga.com . I would be happy to discuss any concerns Vic might have about children being exposed to an empowering tool such as yoga and meditation. Bachelor Degree of SCIENCE ( Psychology Major) . Qualified and Certified Adults and Children's Yoga teacher and Meditation Coach. Thank you Natasha for your factual and detailed account into the scientific and physiological nature of yoga in response to Vic Trudeau's warped view in her letter to the editor recently. As a primary school teacher who has attended Natasha's yoga school classes at 2 different schools and been a yoga student of her myself for the last 4 years I can't thank her enough for the benefits she has opened up for myself and others on both a physical and mental journey of well being. Keep up the great work and namaste.